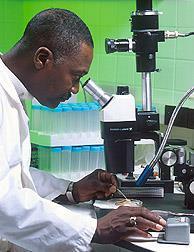 A microbiologist examining cultures under a dissecting microsope. Medical microbiology is a branch of bacteria, fungi, parasites and viruses and one type of infectious protein called a prion. A medical microbiologist studies the characteristics of pathogens, their modes of transmission, mechanisms of infection and growth. Using this information a treatment can be devised. Medical microbiologists often serve as consultants for physicians, providing identification of pathogens and suggesting treatment options. Other tasks may include the identification of potential health risks to the community or monitoring the evolution of potentially virulent or resistant strains of microbes, educating the community and assisting in the design of health practices. They may also assist in preventing or controlling epidemics and outbreaks of disease. Not all medical microbiologists study microbial pathology; some study common, non-pathogenic species to determine whether their properties can be used to develop antibiotics or other treatment methods. Whilst epidemiology is the study of the patterns, causes, and effects of health and disease conditions in populations, medical microbiology primarily focuses on the presence and growth of microbial infections in individuals, their effects on the human body and the methods of treating those infections. Anton van Leeuwenhoek, is considered to be the one of the first to observe microorganisms using a microscope. In 1676, microscope of his own design. In 1796, using an ancient Chinese technique for smallpox vaccination, Edward Jenner developed a method using cowpox to successfully immunize a child against smallpox. The same principles are used for developing vaccines today. In 1867 Joseph Lister is considered to be the father of antiseptic surgery. By sterilizing the instruments with diluted carbolic acid and using it to clean wounds, post-operative infections were reduced making surgery safer for patients. In the years between 1876-1884 Koch's postulates. A major milestone in medical microbiology is the Gram stain. In 1884 Hans Christian Gram developed the method of staining bacteria, to make them more visible and differentiable under a microscope. This technique is widely used today. Like other pathogens, viruses use these methods of transmission to enter the body, but viruses differ in that they must also enter into the host's actual cells. Once the virus has gained access to the host's cells, the virus' genetic material (RNA or DNA) must be introduced to the cell. Most viruses achieve this through the use of enzymes to break up the viral genome so that only nucleic acids are present for expression, whilst other viruses such as poxviruses, utilize two stages for expression: enzymatic breakdown followed by the release of viral DNA which is mediated by the gene products created during the initial infection. The mechanisms for infection, proliferation, and persistence of a virus in cells of the host are crucial for its survival. For example, some diseases such as measles employ a strategy whereby it must spread to a series of hosts. In these forms of viral infection, the illness is often treated by the body’s own immune response, and therefore the virus is required to disperse to new hosts before it is destroyed by immunological resistance or host death. In contrast, some infectious agents such as the Feline leukemia virus, are able to withstand immune responses and are capable of achieving long term residence within an individual host, whilst also retaining the ability to spread into successive hosts. Cell Culture: Human or animal cell cultures are infected with the microbe of interest. These cultures are then observed to determine the effect this new microbe has on the cell. This technique is used for identifying viruses. The previously mentioned Electron microscopes and fluorescence microscopes are also used for observing microbes in greater detail. Fast and relatively simple biochemical tests can be used to identify infectious agents. For bacterial identification, the use of metabolic or enzymatic characteristics are common due to their ability to ferment carbohydrates in patterns characteristic of their genus and species. Acids, alcohols and gases are usually detected in these tests when bacteria are grown in selective liquid or solid media, as mentioned above. In order to perform these tests en masse, Vitek machines are used. These machines perform multiple biochemical tests simultaneously, using cards with several wells containing different dehydrated chemicals. The microbe of interest will react with each chemical in a certain way, aiding in its identification. ^ Frank N. Egerton (2006). 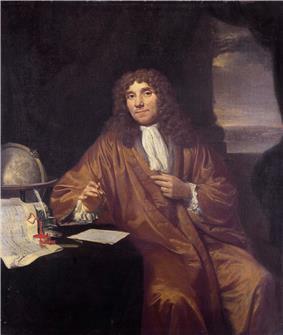 "A History of the Ecological Sciences, Part 19: Leeuwenhoek's Microscopic Natural History". Bulletin of the Ecological Society of America 87: 47. ^ Madigan M; Martinko J, eds. (2006). Brock Biology of Microorganisms (13th ed.). Pearson Education. p. 1096. ^ Shaikh N; Leonard E; Martin JM (September 2010). "Prevalence of streptococcal pharyngitis and streptococcal carriage in children: a meta-analysis". Pediatrics 126 (3): 557–564. ^ Vos T; et al. (December 2012). "Years lived with disability (YLDs) for 1160 sequelae of 289 diseases and injuries 1990-2010: a systematic analysis for the Global Burden of Disease Study 2010". Lancet 380: 2163–96. ^ "Typhoid Fever". World Health Organization. Retrieved 2013-04-25. ^ a b "World Health Statistics 2012". World Health Organization. Retrieved 2013-04-25. ^ Dennehy PH (2012). "Rotavirus infection: an update on management and prevention". Advances in Pediatrics 59 (1): 47–74. ^ "Hepatitis C". World Health Organization. Retrieved 2013-04-25. ^ Dunne EF; Unger ER; Sternberg, M (February 2007). "Prevalence of HPV infection among females in the United States". Journal of the American Medical Association 297 (8): 813–9. ^ Kappus KD; Lundgren RG, Jr.; Juranek DD; Roberts JM; et al. (June 1994). "Intestinal parasitism in the United States: update on a continuing problem". American Society of Tropical Medicine and Hygiene 50 (6): 705–13. ^ "Toxoplasmosis". Centers for Disease Control and Prevention. Retrieved 2013-04-25. ^ "Candidiasis". Centers for Disease Control and Prevention. Retrieved 2013-04-25. ^ "Histoplasmosis". Centers for Disease Control and Prevention. Retrieved 2013-04-25. ^ Washington, JA (1996). "10 Principles of Diagnosis". In Baron, S. Medical Microbiology (4th ed.). University of Texas Medical Branch at Galveston. ^ a b c Siebeling, RJ (1998). "Chapter 7 Principles of bacterial pathogenesis". In Bittar, Neville, E, B. Microbiology. Elsevier. p. 87. ^ Rhinehart E; Friedman M (1999). Infection control in home care. Jones & Bartlett Learning. p. 11. ^ Roizman, B (1996). "42 Multiplication". In Baron, S. Medical Microbiology (4th ed.). University of Texas Medical Branch at Galveston. ^ Hilleman M (October 2004). "Strategies and mechanisms for host and pathogen survival in acute and persistent viral infections". Proceedings of the National Academy of Sciences of the United States of America 101: 14560–14566. ^ Greggs WM; Clouser CL; Patterson SE; Manksy LM (April 2012). "Discovery of drugs that possess activity against feline leukemia virus". Journal of General Virology 93 (4): 900–905. ^ Nester E; Anderson D; Evans Roberts, C; Nester M (2009). Microbiology: A human perspective. McGraw Hill. pp. 336–337. ^ Møller M; El Maghrabi R; Olesen N; Thomsen VØ (November 2004). "Safe inoculation of blood and bone marrow for liquid culture detection of mycobacteria". Occupational Medicine (London) 54 (8): 530–3. ^ Nester EW, Nester MT, Anderson DG, C. Evans Roberts J (2008) Microbiology: A Human Perspective: McGraw-Hill Higher Education. ^ a b Mackay I (2007). Real-time PCR in Microbiology: From Diagnosis to Characterisation. Horizon Scientific Press. pp. 1–25. ^ a b Viljoen GJ; Nel LH; Crowther JR, eds. (2005). Molecular Diagnostic PCR Handbook. Springer. p. 58. ^ Tang YW; Persing DH (2009). Encyclopedia of Microbiology. Oxford Academic Press. pp. 308–320. ^ Vickery K, Hu H, Jacombs AS, Bradshaw DA, Deva AK (2013) A review of bacterial biofilms and their role in device-associated infection. Healthcare Infection -. ^ Stewart PS; Costerton JW (July 2001). "Antibiotic resistance of bacteria in biofilms". Lancet 358 (9276): 135–8. ^ Taguchi T, Yabe M, Odaki H, Shinozaki M, Metsä-Ketelä M, Arai T, Okamoto S, Ichinose K (2013) Biosynthetic Conclusions from the Functional Dissection of Oxygenases for Biosynthesis of Actinorhodin and Related Streptomyces Antibiotics. Chemistry & Biology 20:510-520. ^ Williams NT (2010) Probiotics. American journal of health-system pharmacy : AJHP : official journal of the American Society of Health-System Pharmacists 67:449-458. Medical microbiology is not only about diagnosing and treating disease, it also involves the study of beneficial microbes. Microbes have been shown to be helpful in combating infectious disease and promoting health. Treatments can be developed from microbes, as demonstrated by Alexander Fleming's discovery of probiotics to provide health benefits to the host, such as providing better gastrointestinal health or inhibiting pathogens. Whilst drug resistance typically involves microbes chemically inactivating an antimicrobial drug or a cell mechanically stopping the uptake of a drug, another form of drug resistance can arise from the formation of biofilms. Some bacteria are able to form biofilms by adhering to surfaces on implanted devices such as catheters and prostheses and creating an extracellular matrix for other cells to adhere to. This provides them with a stable environment from which the bacteria can disperse and infect other parts of the host. Additionally, the extracellular matrix and dense outer layer of cells can protect the inner cells from antimicrobial drugs. In addition to drugs being specific to a certain kind of organism (bacteria, fungi, etc. ), some drugs are specific to a certain strains of an organism may be resistant to a certain drug or class of drug, even when it is typically effective against the species. These strains, termed resistant strains, present a serious public health concern of growing importance to the medical industry as the spread of antibiotic resistance worsens. Antibiotic resistance tests: The bacteria in the culture on the left are sensitive to the antibiotics contained in the white, paper discs. The bacteria in the culture on the right are resistant to most of the antibiotics. Medical microbiologists often make treatment recommendations to the patient’s physician based on the strain of microbe and its antibiotic resistances, the site of infection, the potential toxicity of antimicrobial drugs and any drug allergies the patient has. Once an infection has been diagnosed and identified, suitable treatment options must be assessed by the physician and consulting medical microbiologists. Some infections can be dealt with by the body’s own immune system, but more serious infections are treated with antimicrobial drugs. Bacterial infections are treated with antibacterials (often called antibiotics) whereas fungal and viral infections are treated with antifungals and antivirals respectively. A broad class of drugs known as antiparasitics are used to treat parasitic diseases.